Xiaomi's first smartphone with Android Go is here, the Redmi Go. The expectations towards the 80-Euro (~$91) smartphone are high, since the company has so far succeeded in offering great performance for a good price over and over again. Does this also work in the absolutely cheapest price segment? Yes, you should if you're looking to buy a smartphone for the first every time. The Redmi Go is extremely easy to use unlike more costly phones. Overall the Redmi Go looks cute, offers great build and form factor and also handles the daily performance pretty well for the price it comes for. The specs and the performance the Redmi Go offers for the price (Rs 4,499) are incredible. However, (being a little greedy) I wish the software was cleaner and the cameras captured better pictures. But still, I believe the Redmi Go is a really good choice under Rs 5,000. Given its price point and what you get, we were pleasantly surprised at what we could play on the Redmi Go. Unless you're hellbent on playing PUBG in some form, the Redmi Go can handle recent 3D graphics-intensive games at a smooth frame rate with few issues. You obviously won't get performance on par with flagship devices, but you're paying fraction of the cost, making it a fair trade off as long as you keep your expectations in check. Positive: Low price; decent hardware; nice display; large battery capacity. 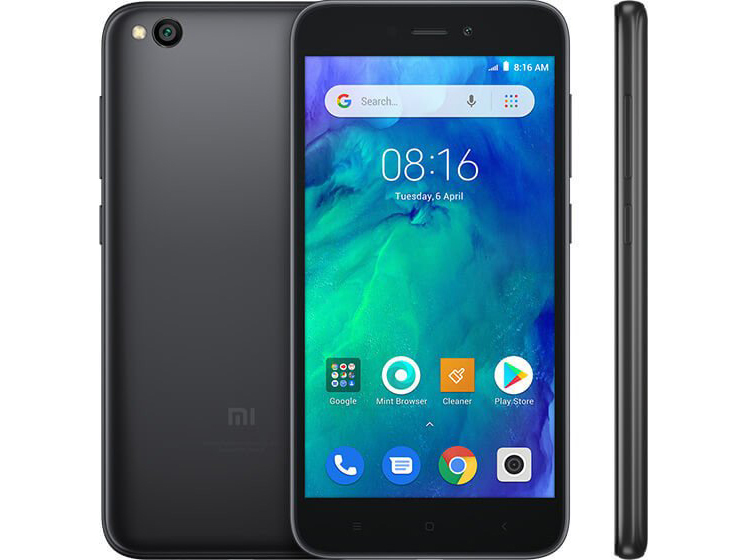 Model: The Xiaomi Redmi Go is the company’s first Android Go phone. It is an ultra-budget smartphone, which still features decent hardware performance. The body is made out of aluminum alloy and glass, which is great for stability and fashion as well. The Redmi Go comes with pretty thick bezels on all side. Sadly there’s no fingerprint sensor and, considering it is a very cheap phone, there it also does not support face unlock. The phone's weight is 137 grams, and dimensions 140 x 70 x 8.4 millimeters. As for the display, the Xiaomi Redmi Go flaunts with a 5.99-inch IPS LCD display with 720 x 1,440 pixels. The pixel density of 269 PPI gives sharpness to the view. The Redmi Go includes one camera on the back and one on the front panel. On the rear panel, the Redmi Go sports an 8 MP camera paired with a LED flash, which sits right next to it, while on the front the Redmi Go includes a 5 MP selfie camera for clicking selfies. Under the hood, the device packs a quad-core processor having 1.4 GHz clock speed. It is further accompanied by 1 GB of RAM to ease the performance. As for the software, it’s running Google's optimized Go Edition of Android 8.1 Oreo out of the box. Android Go will allow users to use Go applications, such as Search, YouTube, Files, Gmail and other Google offers. Facebook and Messenger Lite are also available. The Xiaomi Redmi Go sports an 8 MP primary camera with autofocus and LED flash, which can give a good photography experience. The frontal lens is of 5 MP. It can click good selfies. The internal memory is 8 GB. It can store files and data of the users. The device is provided with an external memory slot which can expand storage by up to 128 GB. The device draws the charge from a Li-ion battery of 2,800 mAh, which can provide an ample amount of back up through the day. In terms of connectivity, it comes with multiple options including 4G-VoLTE, Mobile Hotspot, Bluetooth, GPS and USB connection. The Redmi Go supports dual SIM via a hybrid SIM card slot, which houses two SIM cards or a SIM card and a microSD card. As a conclusion, the Xiaomi Redmi Go is a device that covers all the features. For the price, it provides everything a smartphone needs to have. It is not a great smartphone, but it’s decent enough for an ultra-budget low-end Android phone. It is good as the first smartphone for teenagers or other users who only use it for less demanding features. 80.27%: This rating should be considered to be average. This is because the proportion of notebooks which have a higher rating is approximately equal to the proportion which have a lower rating.